In this section of my tour of Aviation Photo Gallery, I will look at WordPress. 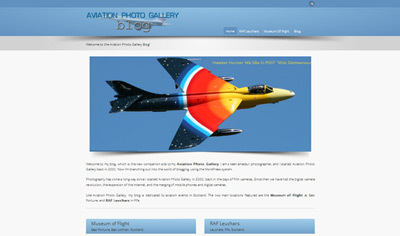 I used WordPress to create Aviation Photo Gallery Blog, an add-on to my main Aviation website. WordPress is a popular open-source content management system. WordPress originally began as blogging software, and has evolved into a content management system for publishing websites. Its two key components are MySQL, an open-source relational database management system, and PHP, an open-source server-side scripting language. MySQL stores the content, and PHP does the work of presenting the content to the user. A template system, which enables the user to change the appearance of the site, without altering the content. WordPress templates are known as themes. A plugin system, which extends the functionality of the site. A dashboard. This is the administration and control area of the site. The Dashboard is the nerve-centre of WordPress. All the functionality is controlled from here, including themes, plugins and updates. Content such as static pages, posts and images are also added via the Dashboard. I installed WordPress in a sub-folder of Aviation Photo Gallery, to keep the Blog separate from the main site. The URL is www.aviationphotogallery.co.uk/blog. 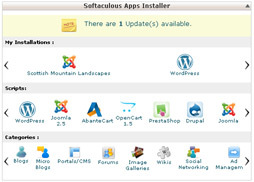 I used the Softaculous Apps Installer to install WordPress. Softaculous is an auto installer for web software, and is available through cPanel. cPanel is an online web-hosting control panel which handles the administration of my websites. It is provided by my web hosting company. There are two types of WordPress themes: open-source and commercial. The WordPress organisation maintains a directory of themes here. Many companies offer commercial themes, including Themeforest. I decided to use a commercial theme for its enhanced functionality. I chose the Flare theme by bringthepixel, which I purchased through Themeforest. Flare is a responsive business and portfolio theme, which incudes the Revolution slider plugin as standard. Plugins are software add-ons, which extend the functionality of a WordPress website. The WordPress organisation maintains a directory of plugins here. All In One SEO Pack. I use this plugin to set the SEO title, description and keywords for pages and posts. Updraft Plus. This plugin creates complete backups of the site, which can be downloaded and stored offline. Contact Form. This plugin provides a basic contact form. Captcha. This plugin provides a captcha, which can be configured to prevent spam being sent by the contact form. CP Google Maps. This plugin displays a Google map or satellite view on pages or posts. Duplicate Post. A very useful plugin, which allows me to copy a post or a page, and save under a different name. Strangely, this feature is not included in the basic WordPress editor. Pretty Photo Media. A basic lightbox, for displaying images. The Flare theme has loads of options for customisation. It is possible to customise the colours for all the areas of the page, including the pre-header, header, pre-content, content, pre-footer and footer. I chose a colour scheme similar to that of my main Aviation Photo Gallery site. 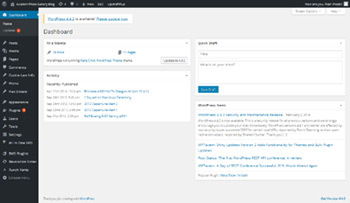 WordPress caters for all levels of computer users, including web developers who may wish to customise a site to a greater extent than the average user. The child theme system enables such enhanced customisation. A child theme is a copy of the original parent theme, which enables the user to modify the site. I created a child theme to enable me to add custom CSS to the site. If the parent theme is ever updated, any modifications in the child theme are preserved. I added my custom CSS to the child theme using the Appearance > Editor > Edit Themes section of Dashboard. In the next section of the tour, I will look at Joomla.